A clay tray somewhat like a flat bowl is on the floor in which the stove is sitting. It is not required however air should not be able to enter under the stove body. The outer body is a clay cylinder of approximately the same dimension as the Vesto - 440 high and 290 diameter. There are air inlet holes partway down the side and there is in this case no air controller fitted. Inside the outer tube sits the secondary air tube with an outward protruding lip. There is another one visible at the top of the picture standing on its own. This part is analagous to the top deck and air tube made of metal on the Vesto. Next there is a metal ring which serves to support the standard 3CR12(stainless) Vesto combustion chamber. The ring closes the gap between the OD of the combustion chamber and the ID of the clay air tube. 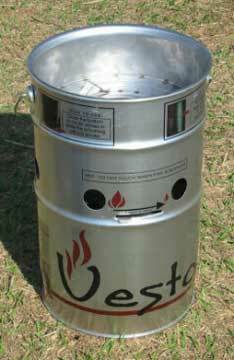 The steel bar pot stand is a standard Vesto BBQ Plate stand. It creates an 8mm gap between the top of the outer body and the pot bottom. The performance would have been enhanced if the pot sat down into the outer tube on a small pot stand. The thermal performance of this unit was remarkable: about 52% of the heat available in the charcoal (calculated at 28 Mg/Kg) got into the pot. 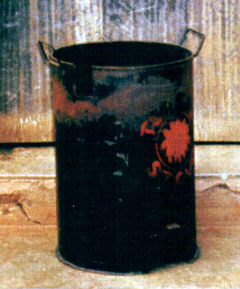 This is roughly 10% higher than for a good ceramic Jiko and is attributed to the combination of having the combustion chamber the correct diameter and to the insulative effects of the clay. There is still room for improvement through the use of a shorter combustion chamber (not has much head space is required) and of course a pot skirt. The clay parts are cheaper than stainless steel ones, however they are far heavier and not as transportable. The air and fire system did not in fact work in the same way as a Vesto in that there was very little primary air pre-heating because the air tube was made of ceramic. It might be more accurate to say it works in a way somewhere between a Tsotso Stove and a Vesto. b) clay stoves are heavy, breakable and unknown. The selling point has to be fuel economy and perhaps appearance (pride of ownership). >The "tincanium" stoves are easy to construct. They have a very low >heat capacity compared to clay. They are lightweight and not fragile. >They can be mass produced. I have yet to see a clay stove that duplicates these virtues. CPP>Exactly. However high thermal mass offers other benefits, in particular the provision of retained heat to the primary air late in the fire's burn increasing the usually low combustion efficiency. The reduction in CO later on is very valuable both to reduce emissions and to increase the heat output basically for free, though some of the heat might have been available earlier on which could affect performance. Overall clay stoves have long term advantages that may see them gain wide acceptance. First, they can be made cheap and in large quantities in modestly sized businesses so that a standard product can reach the market with a predictable performance. This is valuable when scaling up production in a city and when there is local or regional advertising touting them. 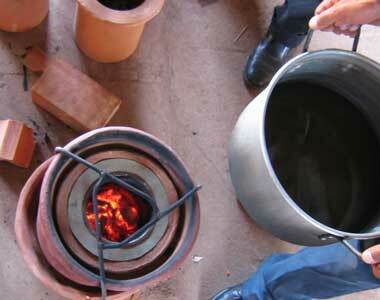 Artisanal stoves suffer from variability / inconsistency. Clay stoves can have both a fairly high insulative value, giving early flame temperature rise, as well as the ability to store some heat for later when the amount of fuel is greatly diminished. The effect can best be seen when looking at a limited time 'cook' instead of pretending that the stove works in a continuum. For example saying (as a criticism) that clay absorbs heat from the fire in the early stages does not mean that it continues to do so after a time. It is a temporary thing and the heat can be returned later, not to cook without a fire, but to heat the incoming air and assist the burn over a 10 or 20 minute period as the stove body cools. The effect on emissions is pronounced. Late in the burn when a charcoal stove is in the dying-fire stage, heat transfer efficiencies frequently exceed 100% as the heat is recovered from the stove body while simmering. This effect is only minimal with light metal bodies. Thus clay stoves have some inherent advantages over light metal ones. As for the possibility of a hybrid clay+metal stove, the most efficient wood or charcoal stove I have tested to date was a clay bodied stove with a Vesto fire grate in it. Its overall efficiency (PHU) was 52% and I can say it was not optimised - just the parts we had available tossed together. Joäo Da Conceiçäo made the clay parts and the Vesto parts were standard. I did the testing with charcoal. The reason for the efficiency is that the metal parts that do the air preheating and fire manipulation are placed in the middle where these attributes are most required. The clay on the other hand is used to provide stability and huge thermal insulation. The stove did not get noticeably warm on the outside after more than an hour. The resulting stove looked a great deal like a heavy clay Vesto. It was stable and cheaper that an all-metal Vesto. 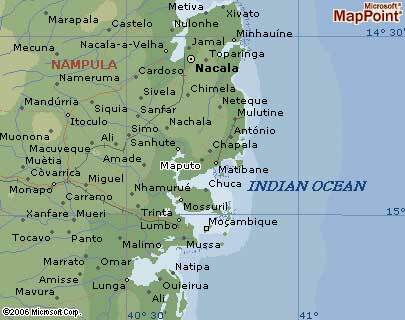 A variation on this has been on sale by ICEMA in Maputo for almost a year using locally made non-stainless steel inner parts.